White or light gray grout for carrera marble tile floor? Debating between three grout colors for a new Carrera marble bathroom floor. light gray - it may provide a little contrast but overall will match the most . . I agree. Light gray is my recommendation as well. I have gray tile with gray grout. Everyone thinks it works well. I have actually done a medium blue/grey which was the same as the darker veins in the marble. The look was great and a little more dramatic than the light grey. It was also easier to keep clean. 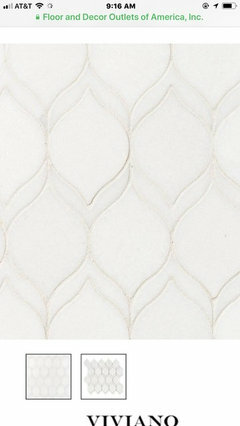 I recommend Custom Building Products Polyblend Grout color Platinum. It's the perfect color for Carrera Marble! I try to NEVER use a light grout UNLESS tile is being placed in a very low traffic area. I think marble looks BEST with very small space between the tiles. The darker color will enhance the design in your tile. I agree white grout is a pain to look after and usually over time yellows so I vote for light gray. Whisper gray grout from The Tile Shop ( Edison, NJ) is what this display shows with carerra marble. I agree, you should consider maintenance. White grout looks great in low traffic area. However, for a floor the darker grout might be the better option. It will be easy to clean and maintain. The white or light grey will darken with wear anyways. LOL! I had to take a look at mine; realizing that I hadn't noticed it. But, that's the point hey!? I also found platinum grout to match nicely. However some carrara ' s are different shades and some are lighter. Usually white is too light but a silver color can look nice. When we color seal grout I customize the exact shade of white/grey to match and it cleans better than non color sealed darker grout. We always recommend darker grey with the Carrara, accentuating the darker veins - maintenance is much easier for the clients too. Whatever you do, don't use light grout on the floor! It was ALWAYS look dirty! I have a friend who made this same mistake. Looks gorgeous once it's first installed. But the grout will eventually turn brownish/yellow. Go darker! i recommend a contrasting color for your mosaic tile to highlight the shape. if you went with white you wouldn't see much of the shape and it would blend into the wall. A light gray would highlight it really nicely I think, and you mentioned you will have other grays in your room too. I'm having the same problem Dorian gray or platinum? Definitely stay with a lighter color for marble. I hear it quite often, dark grout can sometimes seep into the sides of a light marble and stain it, causing it to look dingy overall. 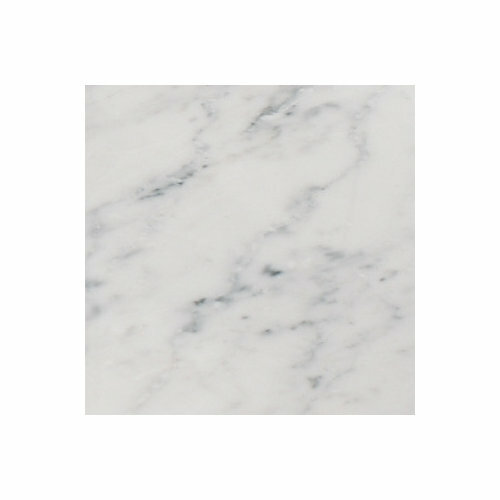 My vote is white, it will keep the marble looking pristine and will darken a bit over time, matching the look of natural carrara quite well. White grout is a risk in bathrooms though, as everyone mentions. 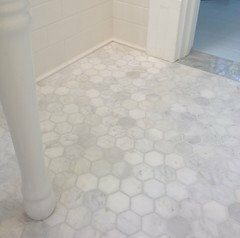 Use a non-sanded grout to protect both the marble and the grout from discoloring too much. 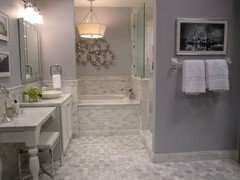 The light gray is also a fine choice, but keep in mind that it will darken and maybe not match the tile color quite as well over time. Make sure to seal the tile once a year, especially on a bathroom floor, and seal the grout once every 10 years - people tend to forget that one! White grout or grey grout?